UFO sightings have been reported throughout recorded history. Among the most recent that made it to mainstream news took place in Mississippi in February. 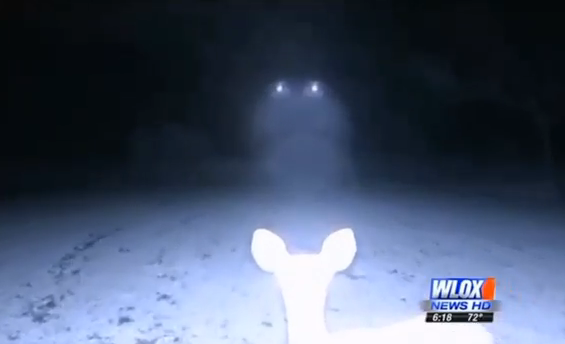 A deer cam set up by a Jackson County couple on their wooded property captured mysterious set of hovering lights from a UFO. Edith and Rainer Shattles, who used the infrared camera to spot wildlife in their fields, were shocked to discover the morning after that clear winter night the strange lights caught by their trail camera. Images from the cam appear to show two beams of light before the unidentified object appears to fly off into the night sky. "Well at first, I was trying to see if it was something or a reason for what we were seeing," Edith told WLOX news. "But the more we looked at it, the more we realized that it was something that was in the air, it was something that I had never seen before." The couple's property is located at Cumbest Bluff, a remote area of Jackson County not far from the infamous Pascagoula Abduction of 1973.